Will Samer Issawi be the next victim of medical neglect by the Israeli Prison Service? Reading “With My Own Eyes” by the Israeli lawyer Felicia Langer brought painful scenes to my mind, but my faith in humanity grew deeper. While the Zionists might proclaim “woe to the vanquished,” there were Jewish people in Palestine, such as Langer, who, more profoundly, recognized it was “woe to the victor.” Langer was one who fought bravely against the unjust Israeli system throughout her 23-year career. She defended my father Ismael Abusalama in Israeli courts. He has always spoken about her with admiration and respect for her humanity and firmness. I have no doubt that she tried hard to expose the reality and prove my father and other detainees innocent, but Israel’s unjust judicial system was stronger than her. Her dedicated investigations and defense of the truth didn’t stop Israel from sentencing my father to seven life sentences and 35 years! I appreciate her book, which exposes the injustices of the Israeli occupation and the rotten justice system in Israel. She has always repeated that the aggressor can never win. And I have faith that Israel will never win and Palestine shall be free. Medical neglect is one of the major brutal policies the Israeli Prison Service (IPS) practices intentionally against Palestinian political prisoners which Langer aimed to highlight in her book. “IPS deliberately aims to harm Palestinian detainees’ physical and mental health in any possible way,” my father repeatedly says and many released prisoners have agreed. Because of this, access to proper medical care has been always on the top of detainees’ demands whenever they go on mass hunger strikes. Akram ended his hunger strike in exchange for an agreement by Israel for his early release. As part of the agreement, Akram was supposed to be released on January 25, 2013. But it’s been more than a week since that date passed, yet we have heard nothing regarding his release. This is more evidence that Israel never keeps any promises or agreements. On January 22nd, I came home from my last exam of the semester very happy and relieved that I could finally sleep without worrying about loads of studies. I put myself in bed and decided to check my Facebook before I closed my eyes. I saw a video shared by my friend Loai Odeh that turned my happiness into sadness and my relief into distress. My desire to sleep escaped me. Then I Googled his name and the ambiguity behind the pronouns he used became no longer ambiguous and learned that Ashraf, a 29-year-old from Hebron, was released recently after a detention of six and a half years in Ramleh prison hospital. Only then did I realize that the pronoun “they” refers to the IPS. Ashraf was released on November 15, 2012. He spent only ten days outside Ramleh prison hospital at home, surrounded by his beloved family. But those ten days were an extension of the pain he suffered during his imprisonment. Then he fell in a coma until his death on January 21, 2013, which could have been avoided if he had access to better medical care. 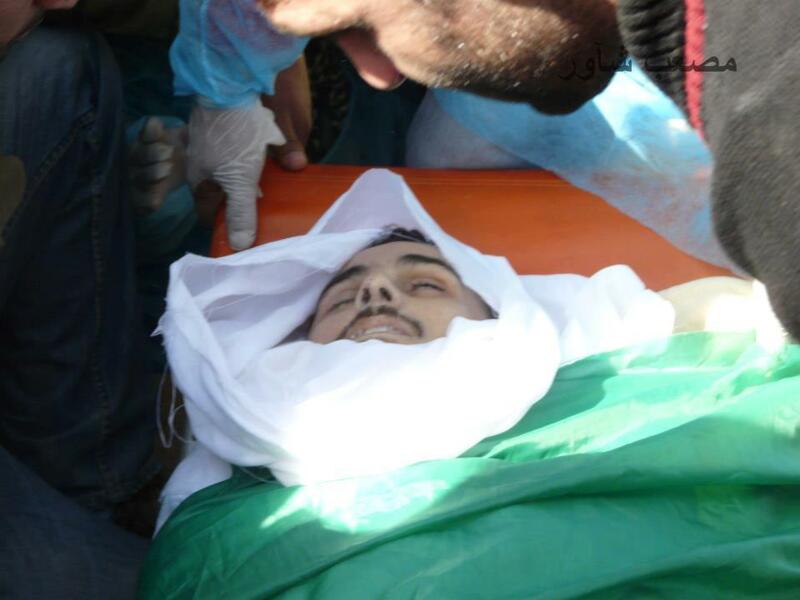 Israel must be held responsible for the murder of Ashraf. Ashraf had a long history of medical problems that predate his arrest; he suffered from muscular dystrophy and as a result became wheelchair bound in 2008 during his imprisonment. During his detention he contracted several illnesses including lung failure, immunodeficiency and a brain virus that eventually lead to his death. Due to the frequent denial of medical treatment by the Israeli Prison Service (IPS), Ashraf suffered a slow and painful death that was exasperated by neglect and the prison service’s refusal to provide court-ordered treatment. In 2008, Physicians for Human Rights – Israel (PHR-I) submitted a request to the Israeli district court for Ashraf to receive physical therapy. Although the court granted Ashraf this request, the ruling was ignored by the Ramleh prison hospital, who refused treatment claiming that it was unnecessary. Ashraf was held in captivity despite his failing health for the entirety of his sentence, rarely seeing an independent doctor. He started his battle with a promise that he would only retreat from it as a martyr. Samer has tasted the bitterness of imprisonment for 12 years before. But once he was re-arrested in July 2012, with no charge or trial, he decided to rebel to send a message to his captors that they couldn’t decide his destiny. He doesn’t do this from love for death. He loves life, but in the form he has always longed to have, a life of freedom and dignity. Serious actions are needed as Samer stands at the edge of death. He suffers from severe pain all over his body, especially in his abdomen and kidney. He has double vision, dizziness, and fractures in his rib cage from a brutal attack by Israeli soldiers while he was handcuffed to his wheelchair at a court hearing. This injury has caused severe and persistent pains that leave him sleepless day and night. We shouldn’t sit idly and watch Samer slowly die. We don’t want to count more Palestinian detainee as martyrs. If Samer dies, it will be a glory for him, but a shame for us. Our silence allows Israel to cross all red lines. Save Samer from being the next victim of medical neglect after Ashraf Abu Dhra’. Act now to rescue the lives of Samer and all hunger strikers. This entry was posted on February 4, 2013 by Shahd Abusalama. 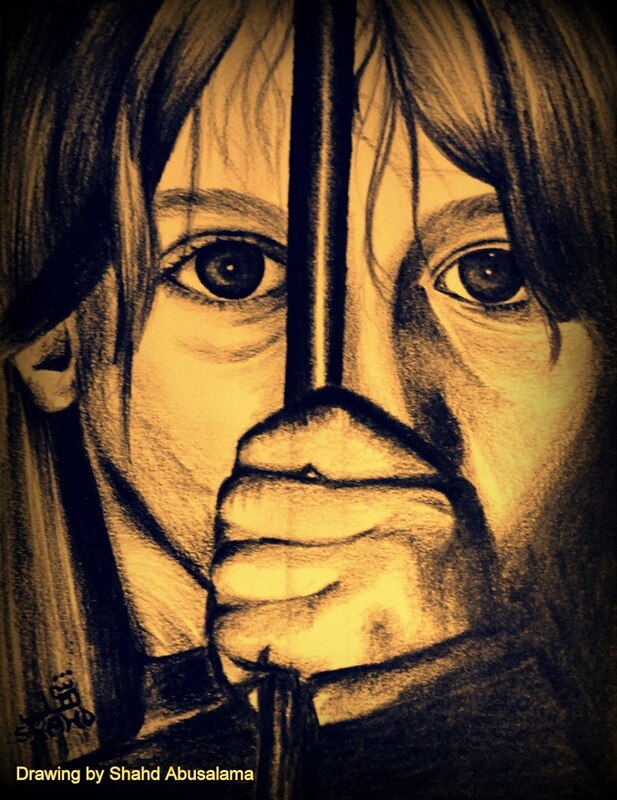 It was filed under Palestinian Political Prisoners and was tagged with Addameer, Administrative detention, Akhram Rikhawi, Ashraf Abu Dhra', Felicia Langer, From My Own Eyes, Gaza, Hunger Strike, Ismael Abusalama, Medical neglect, Palestine, Palestinian Political Prisoners, Samer Issawi, Six Day War. I live in the US, and I have no idea how to “act now”. Please, if you do have links to organizations and petitions to support share them. It’s hard to discern from afar which organization represents the actual “will of the people” the best. We can use all the help here in the US to raise awareness & try to pressure the so called “American” gov’t. We had banner drops in a few cities and a few protest. We are brainstorming more ideas for ground actions to be taken place soon. Thank you again for supporting this cause and the more people we have the better chance we have at saving Samer and all other Palestinian Prisoners. Tae, thanks for your interest to help! There must be a way for any person to help, regardless of where they live. This makes grim reading dear Shahd. Many of the facts I know well about the ill treatment of prisoners but these facts are hidden from the wider world due to a number of factors you and I know only too well. Your father, like so many Palestinians who have been incarserated in the zionist jails, is living proof of the illegal, unjust and inhumane practicstics of the IPS. We continue to struggle against the odds to bring this to the world’s attention and to save Samer and all the Palestinian prisoners. Thanks to you and other dedicated activists/bloggers we are being heard more and more but sadly most of the worlds politicians are turning a deaf ear. But we will not stop until justice is served. I think it is also important to point out that Felicia Langer is one of many Israeli’s that has not succumbed to the narcissistic ideaology of Zionism. An ideaology that is the root cause of the trouble in Palestine and has nothing to do with Judaism. There are many more voices of dissent coming out of Israel, like Miko Peled, who are exposing the zionist entity for what is is, a terrorist state. InshAllah together we will be able to save Samer and the other hunger strikers and bring peace and self determination to Palestine. God bless you and thank you Shahd. Thanks Robby! Your comment is beautiful, powerful and informative! It shows the great mind behind you beautiful soul :) The increasing number of Israelis who decided to stand firm and fight the terrorism of the apartheid regime of Israel gives us hope that Israel must fall someday and justice shall prevail! Thanks dear! Shahd, I just wanted to leave a note of encouragement and thank you for these posts. I initially discovered your blog in November during “Cast Lead”, and have been following ever since. I work in a humanitarian/development religious NGO in the US that does nonviolent resistance work in the Palestinian territories. This work is in preparation for my MA graduation in April, at which point I see my work leading me towards the Middle East, and my personal life leading me towards Islam. I wish you all the best, and thank you for keeping us informed. Samer is currently my FB profile pic, but I too am always open to any ways that we can help, or that my org can help. Feel free to email me individually if you so desire and we can discuss further. Thank you. Very touching article Shahd. Felicia Langer gave a lecture at my school many years ago in Ramallah; she got a standing ovation. Thank you for your incredible dedication! Zionism is the cause of the wars in the Middle East. The indifference of the US and EU governments and their blind support for Israel’s brutal actions have succeeded in spreading the violence inflicted on Palestinians to other areas of the world. It’s so clear to me (and many, many others) that peace in the so called “West” depends upon right action and justice for the Palestinians. Reblogged this on Occupied Palestine | فلسطين. remembered forever/ The people shall hear them forever. I weep for Humanity when I read your words. Horror!! That anyone can wittingly shoot a child to death, a child with a school bag, a child returning from school. Horror!! That in order to “choose life” free from oppression, one must slowly starve; for the right to live freely.How brave are the Palestinians; the brave and spirited and beautiful. Palestine!! We are all Palestine. Humanity will prevail against the zionist occupation. Justice and Truth and Freedom must be served.